The Shizuoka Geeks tasted (I would say guzzled down) this extravagant sake (ishobin/1.8 l.) concocted by Oumuraya Brewery in Shimada City as we had a few reasons to celebrate. It is a “limited edition”, so I am religiously (I’m an agnostic hedonist) keeping the labels safe. Its name is “Hanya”. People interested in Japanese culture will be interested, I’m sure! 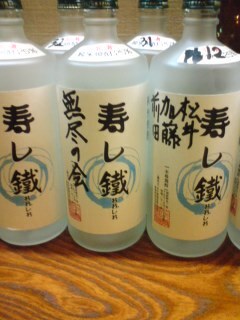 It is also a “tobinkoi”, meaning it was filtered into one of those big glass vats for maturing. Aroma: fruity and light, almost discreet. Elegant. Pineapple. 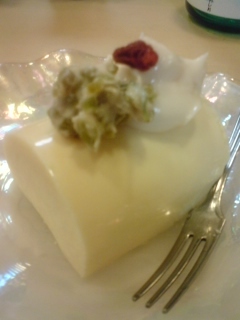 Taste: sweetish at first. Junmai tingle. Fruity: pineapple. Elegant with short tail. Calling for the next sip. So easy to drink. Coffee beans revealed later. 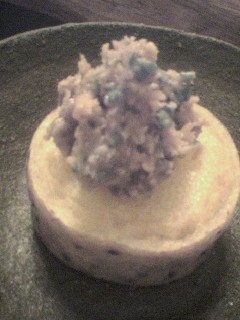 Goes surprisingly well with food, keeping it character all along. Overall: Definitely a bit too extravagant for our rough lot, but who complains? Some people are going to kill me for coming with so few notes for such a beauty! 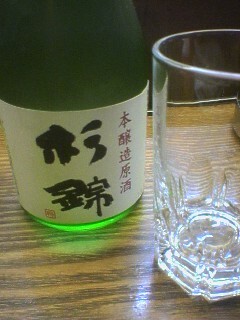 It is a Junmai Daiginjo called “Hanya” and made with Yamada Nishiki Rice from Hyogo Prefecture and Shizuoka Yeast. I can assure it disappeared very quickly as the ladies could not keep their hands off it! Separate tasting posting coming soon! Not many breweries in Shizuoka Prefecture are venturing into manufacturing koshu/old sake, and it is a pity. But things are fortunately slowly changing. Eikun Brewery in Yui has come up for some time with quite an extraordinary brew matured for 10 full years from a batch originally conceived in 1963! 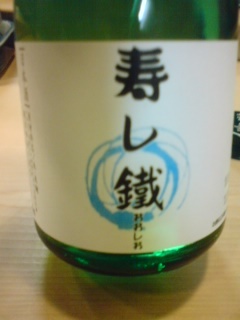 It certainly does not look like a sake! 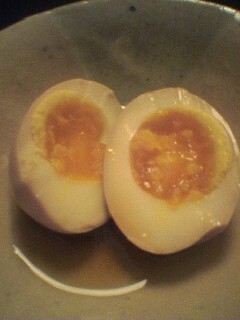 Body: Full, easy on the palate. Taste: Solid. Tastes like an old sherry. Welcome alcohol. Acidity revealed later on the palate as the dry impresion gains emphasis. Overall: maybe an acquired taste for some, but very pleasant. Should be drunk like an old sherry or even like a good port. Goes down well with food. 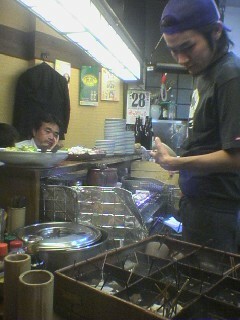 Heated to about 40 degrees celsius, it becomes very pleasant with hot dishes, especillay “nabe”. Do not forget the high alcohol content. Drink sparingly, or it will hit you! 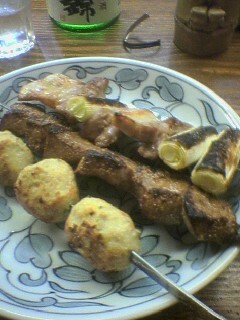 It certainly took me a long time, but I finally paid a visit to Taisaku, the third oldest Izakaya in Shizuoka City! It has entered it sixty-ninth year of existence and is still going solid thanks to a strong sense of tradition nurtured by the family down to the present 3rd and 4th generations. It has alway enjoyed a great reputation and certainly deserves it! 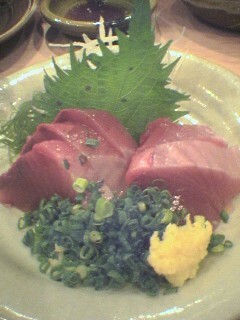 Taisaku prides itself in serving, whenever possible, products from the local seas and lands. 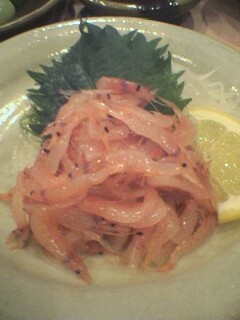 The sashimi are true delicacies, especially raw sakura shrimp (large pic above), not easy to serve so fresh unless you have a direct contact in Yui City, or katsuo/bonito thanks to Yaizu City fishermen. 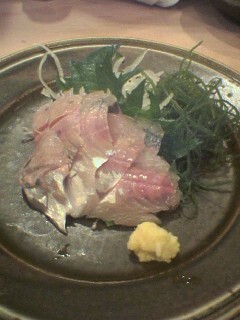 The aji/horsemackerel was a beauty, too. I had to limit myself to those three raw servings this time and will have to come regularly to sample the whole menu changing every day (impossible!). 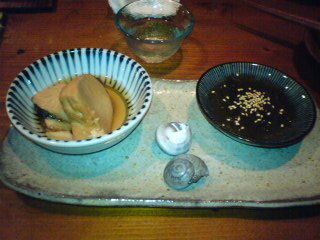 I had time and stomach space left to sample their “kisu to anago no satsumaage”, a fish paste made from two fish caught in Suruga Bay and cooked to perfection. 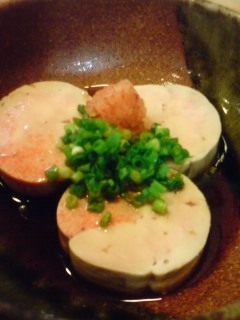 Now, if you know me well, there need be another reason for my introducing an Izakaya: the local sake! 8 Breweries for 11 types of sake, all from Shizuoka Prefecture! As Taisaku is located in Central Shizuoka just behind Shin Shizuoka Center, expect it to be full with patrons of all ages, genders and status! If you wish to talk about local history, you will find the master of the house quite amenable indeed. Not only did he took out old books for me, but he also gave me the name of another Brewery that existed before WWII! 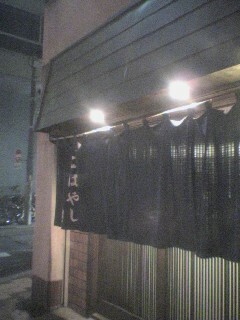 When I entered Odakui on February 8th, I must confess it was already the second establishment I visited that particular night. I had only intended to stay there long enough to give myself a good idea of this establishment introduced to me by its “sister” izakaya, Yasatei. Lucky I was on my own. I can’t imagine what would have happened if a certain Gaijiin Tonic and Foodhoe had been with me! I very much doubt I would have been able to teach from 09:00 the next morning! 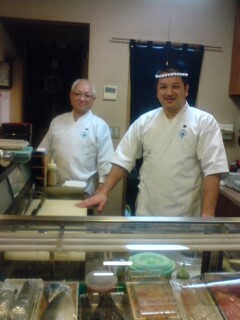 The owner, Naofumi Ohshiro, who opened Odakui 8 years ago before helping open Yassaitei 5 years later, did not know who I was (he could not believe I’m a lecturer!). The gentleman seems to decide on the spur of the moment who he likes or not, unless it was because he is an unconditional fan of the famed Japanese manga artist Ose Akira who wrote the series “Kurabito Claude”, the story of a third-generation Japanese-American who visits Japan to explore his roots and to subsequently become a sake brewer. Nevertheless, when I ordered sake, he told me to bear with him and accept a cup of an absolutely extravagant Junmai Daiginjo (one of the most expensive sake I ever saw in Shizuoka Prefecture!) brewed by Oomurya Brewery in Shimada City as a welcome greeting! 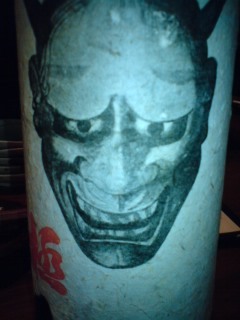 Look at the “Oni’s” face on the label and compare it with Mr. Ohshiro’s on the picture at the top of this posting, holding the famous “Dobu” nigori sake from Nara Prefecture. Can you see a resemblance? All great quality, tasty and cut in the traditional way that Lojol would expect! As Mr. Ohshiro had realized he had found a soulbrother, he came back whenever he could get a minute or two in his busy izakaya, which sits half a dozen at the counter and a good dozen more at two tables set as “horikotatsu”, to engage in this unending conversation on sake and Shizuoka Brewers. 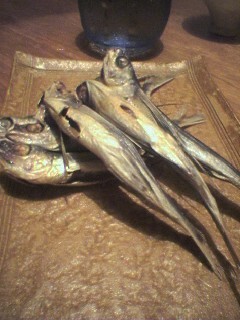 As the conversation was just too great to go back home early, I ordered the grilled “kuro hampen”/dark sardine paste, a specialty only made in our Prefecture, served with grated ginger and chopped leeks. 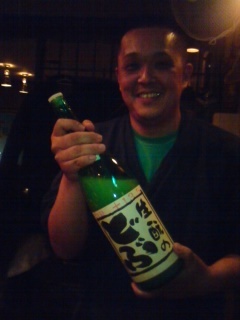 Mr. Ohshiro then insisted I sampled the “Dobu” nigori sake introduced in Akira Ose’s first book. Great sake which completely caught me off guard. 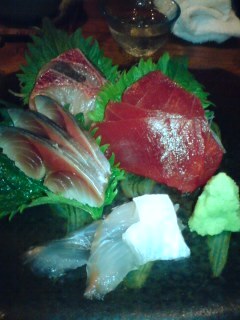 But I wanted to drink a full glass of that “Oni” above-mentioned, or I knew it would stayed on my mind fordays ahead. My host kindly pointed out it was pretty expensive (it was), but I waved his reservations away. I’m sure that Melinda, Etsuko and Tim would have approved! The brew was simply extraordinary, and for all its delicay went down so well with food! I know I’m going to do something really silly soon! Blimey, I had to leave knowing we had not talked about half of what we ought have to, but I knew we had parted at the right time as I had some difficulty riding back home in a straight line on my bicycle! Why do I have the impression that Odakui will become my “next door” (Japanese expression for the second place of the night)? Who am I to complain anyway? It was the turn of Mr. Kawashima, a member of our “Monthly Monday Eatout Group” to choose our meting place, and he elected for our ever-grwoing group (we accounted for 7 participants this time!) 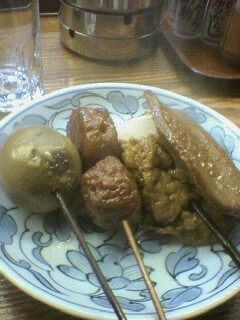 an original izakaya called Nanasei. The restaurant was created 7 years ago by Mrs. Junko Sunada on the first floor of the large house she lives in with her family. 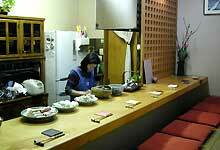 Actually the first floor consists of a counter (see picture above, sitting 6) and a Japanese tatami room (sitting 6~7). The place is very comfortable and easy-going but sophisticated at the same time, all that for comparatively reasonable price. 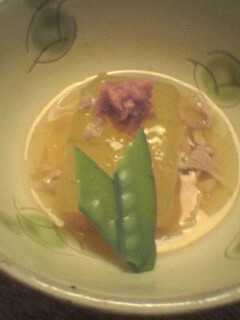 You have more the impression to eat at home than in izakaya/restaurant. It makes the place all the more attractive for small groups searching relative peace and quiet in an intimate environment. Mrs. Sunada makes a great use of local products, especially vegetables, with an accent on lightness and familiar (as of family) tastes, all the while creating original cuisine for all to enjoy, whatever the age or gender. A vegetarian (that I am not) could very well order or reserve a full meal there! The more you eat, the more you feel like drinking, and I have a suspicion that Mrs. Sunada has mastered the art to iduce a customer into sampling her drinking menu! Now, the last is the real reason behind our friend’s choice! I would recommend Nanasei both to couples and groups who wish to share a gastronomic adventure away from the tussle of the town. 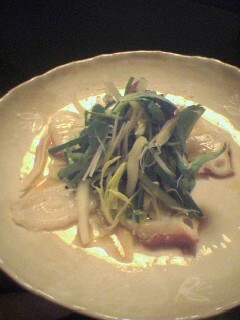 Set menus and a la carte are available. I would suggets both for value and interest to choose the set menu of the day and eventually add one or two more dishes if you are still hungry! 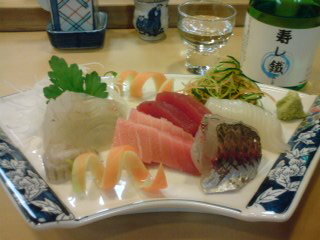 In 2004, Sogatsuru Brewery in Kakegawa City was in a real danger to disappear as they were officially “on vacation”. luckily, they had not relinquished their license when one of the brothers owning Haginishiki Brewery in Shizuoka City decided to go on his own and acquired the precious license. I said “precious” because it is practically impossible to get a new one from the Japanese Tax Bureau. As I had tasted a bottle of the old Sogatsuru Brewery, thinking it was the last one, I have developed a special fondness for that brewery now called Sogatsuru-Hagi no Kura. 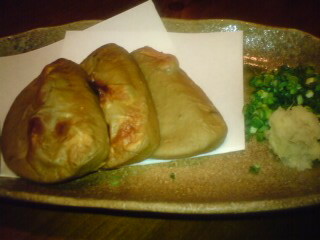 Not only have they revived the Brewery, but they have recently made an extensive use of the appellation “Sagatsuru”, too. Aroma: Sharp and light at he same time. Fruity: Plum, grapes, kinkan oranges. Taste: Welcome acidity due to alcohol. If you are hungry and thirsty, on your way to the station after a long day’s work, but not in a hurry, Kobayashi is certainly one of the most natural places to visit. It stands at a corner just before the back entrance of parco Dept. Store, only a few minutes walk from your train (or your next destination?). The present (young) generation looking after the establishment is the third one following the steps of its founder in the 1950’s. As for drinks, local patrons enjoy the usual fare, but I had the pleasure to discover a local sake on sale, Sugunishiki Honjozo (Sugii Brewery, Fujieda City). 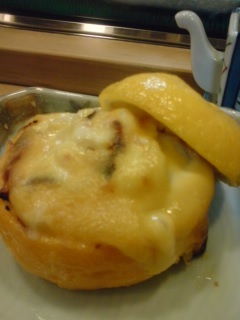 If you on your way back to another Prefecture, make sure to taste it!